Formanites Computing Society (FCS) arranged a lecture ‘Aaloo Andey – Joys of Learning’ on 16 January 2012. 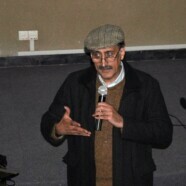 Dr Ashraf Iqbal (Advisor Virtual University) was the guest speaker. Dr Iqbal spoke about pedagogical skills with emphasis on developing new pedagogical techniques by instructors to be used in different classroom environments. He said that learning in class room is now more than just active learning methods laid down by the instructor. Students should be allowed to introduce their own activities within the class room to make learning a joyful experience for both the instructor and the students.The purpose of the lecture was to share ideas for the development and improvement of classroom learning. Faculty members from the departments of Computer Science, Psychology and Biotechnology along with more than 57 students attended the lecture. Guests from institutions outside FCC also came to participate in the learning process.